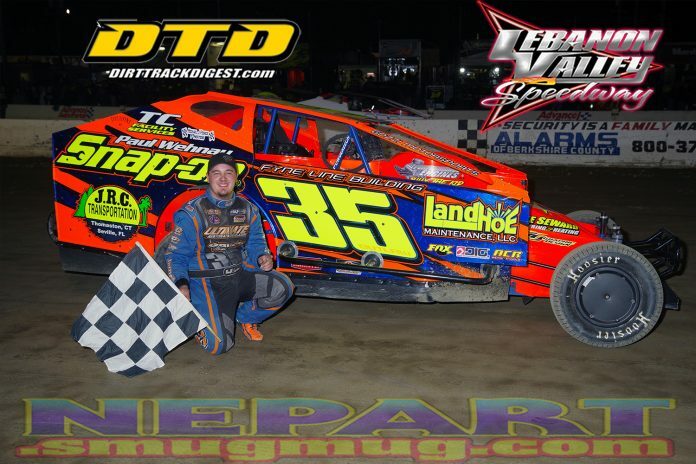 WEST LEBANON, NY – Saturday night saw the Modified and Pro Stock classes run for appearance points only due to tour races at Weedsport Speedway and Autodrome Drummondville. Despite that, there was still plenty of action. L.J. Lombardo designated his girlfriend Mikey Albreada as the person to draw for heat assignment and position. Albreada drew the Heat No. 1 pole for Lombardo. A victory there gave him the pole for the feature. When the green came out, Lombardo was able to open up a small gap on Kyle Sheldon. Last week’s winner Keith Flach scored the fifth starting spot via the heads-up start and quickly moved up to third as the field settled in. On lap 8, the first caution flew when Josh Marcus spun in turn 4. On the restart, Flach was able to get past Sheldon (running a special scheme in honor of his grandfather Todd) for second. Once past, he joined up with Lombardo in order to run away from the pack. Further back, it was rather tough to gain spots. J.R. Heffner and Kenny Tremont Jr. and points leader Ronnie Johnson attempted to move forward, but it was slow going. Flach ended up second, followed by Sheldon. Heffner was fourth, while Tremont was fifth. In the Small Block Modified race, Olden Dwyer started on pole and led early. At the end of the first lap, Chad Pierce had a mechanical failure on the frontstretch and stacked up the field. Harold Robitaille spun to bring out the yellow while trying to avoid. The man on the move was Andy Bachetti. Starting 13th, Bachetti quickly moved into the top five. By Lap 6, Bachetti was already up to third and still charging. Despite the charge, Dwyer was able to open up a big gap on the field. Bachetti was able to take second from Brian Peterson on Lap 13 and immediately set out to catch Dwyer. With superior pace, Bachetti ran down Dwyer in the closing laps. With a couple of laps to go, Bachetti attempted a three-wide move for the lead (while passing the lapped car of Matt Humes) in Turn 1. That didn’t work out, so Bachetti regrouped. On the final lap, Bachetti attempted a massive slide job on Dwyer, but came up short as Dwyer took his first win of the year. Bachetti was second, followed by Heffner, Tremont and Peterson. In Sportsman, Harold Robitaille started from the pole in his No. 03, but the class of the field on this night was Rob Maxon. Maxon started fifth and was able to get to the lead on Lap 2. Shortly afterwards, front-row starter Joey Coppola stalled on the backstretch to bring out a yellow. After another yellow due to Joey Carnibucci stalling in turn 4, Maxon began to run away from the field. Over the final 14 laps, Maxon drove away from the field at an average of nearly a half a second a lap to win by more than six seconds. John Virgilio finished second, followed by Whitey Slavin, Chris Lynch and Chris Curtis. After the race, a protest was levied on Maxon’s engine. The crate motor was thus removed from the No. 96 and taken away for a teardown. Due to the protest, the results are currently unofficial. In Pro Stock, the class ran later than normal. As a result, the race was a bit different as well. Chuck Towslee started on the pole with Jay Casey giving chase. What followed was a 20-lap duel without cautions. By halfway, Towslee was still leading with Jay Casey constantly looking to his inside. Rick Dempsey, Ed Bishop and Jon Routhier were close in tow. These five drivers pulled away from the rest of the field and decided the race among themselves. Later on, Jason Casey joined the battle as well. Jay Casey appeared to have the faster car, but Towslee was able to use the preferred line to hold Jay Casey at bay to claim his first win of the year. The older of the Caseys had to settle for second, followed by Dempsey. Bishop was fourth, followed by Routhier. In Pure Stock, Clifford Booth and Evan Denue picked up victories. Note: The Jay Casey that finished second is from Connecticut, while the Jay Casey classified in 23rd is from Massachusetts. 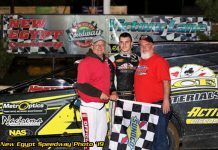 Saturday night saw the Modified and Pro Stock classes run for appearance points only due to tour races at Weedsport Speedway and Autodrome Drummondville. Despite that, there was still plenty of action.